I finished the second installment in Ann Leckie's Imperial Radch trilogy this morning. I wrote last week about my thoughts on her debut novel and my interest in how the story would develop. (You can also find the synopsis of the book at that link.) Much like my reaction to Ancillary Justice, my feelings are mixed. First, the good: I really liked Leckie's characterization of Breq this time around. This novel was much more laden with diplomatic/political scenes than the first, and though this did get dull at times (where's the action, man? ), it was a useful avenue for Leckie to explore her protagonist. A lot of the characters didn't like Breq; heck, I didn't like Breq a lot of the time. She's a tough cookie, and not always in a forgivable, "it's for your own good" way. Watching her struggle with her new responsibilities as fleet captain (both the concrete ones, like managing her ship, and the more intangible ones, like conflict resolution among her staff members) was especially interesting when I wasn't always on her side. I think authors can have a hard time writing main characters that aren't way too "good" or way too "bad," and I was pleased with the balance here. There was also a lot of discussion of the meaning of justice in the context of real, everyday life. "Do you think that if the Lord of the Radch were here she would have seen through everything, to give each act and each actor's heart its proper weight? To dispense perfect justice? Do you think it's possible that any person will ever get precisely what they deserve, no more and no less?" "That is what justice is, Citizen, isn't it?" As someone particularly inclined to justice herself, it was refreshing to see the story complicate the subject and discuss how difficult (and sometimes impossible) it can be to attain. Again, Leckie balances the whole good guy/bad guy dichotomy wonderfully here. You still sympathize with the downtrodden races, at the mercy of the willfully oblivious Radchaai (double-think, anyone? ), but you also feel for the people in power, similarly stuck in situations (though, certainly, much more privileged ones) with a limited set of options. How can you exactly pick who's "right" and who's "wrong"? You can't; you can only make a choice and live with it. As Breq says, "It's best to learn that before you do something you'll have trouble living with." As for the weaker points of the book, I felt the same confusion about what exactly was going on in the story. To some extent, I think this is part of Leckie's point (particularly in how interchangeable the human and ancillary troops are supposed to be, without meaningful personalities, or even names, of their own), but I occasionally had to read over a section several times before knowing what was happening. Leckie's fragment-heavy writing style didn't help matters. Thankfully, I did have many of my lingering questions from the first novel answered. I also found the story to get a bit repetitive; Leckie probably could have accomplished as much as she did in a hundred fewer pages. 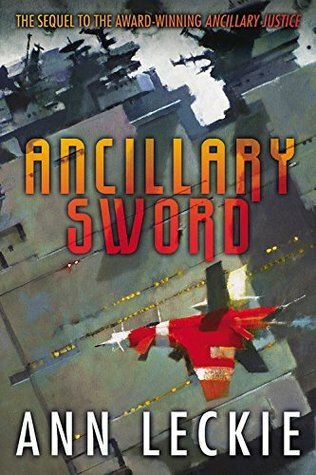 Overall, I enjoyed Ancillary Sword, though it took me about 80 pages until I finally found my groove. I look forward to seeing how the story ends in Ancillary Mercy, slated for release in October 2015. Have any of your read the Imperial Radch trilogy? What did you think of it?